Dr. Yount has been involved the field of Neuromuscular Dentistry and the treatment of Temporomandibular Joint Dysfunction (TMD) for over 25 years. He continues training in Neuromuscular Dentistry because TMD is so debilitating to people of all ages and new advances are constantly being developed. Many people experience the symptoms of TMD at various levels of discomfort and have spent thousands of dollars on cures and appliances that do not work. This condition has many different causes and the symptoms of those who have it are very different. Diagnosing and treating TMD is an intricate process and takes knowledge, patience, expertise in occlusion, and vision. Dr. Yount often says the Naval Academy helped prepare him to treat TMJ because he had to spend so much time problem solving. His System’s Engineering Degree from the Academy also gave him the foundation for, as he calls it, teeth engineering. He is one of the best in this field and works diligently to eliminate or greatly reduce his patient’s pain. He strives for the best result and will go above and beyond to accomplish this for his patients. 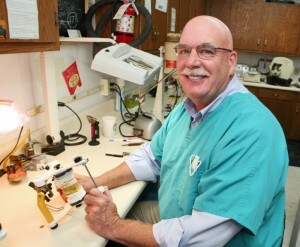 Dr. Yount has completed many courses in the treatment of TMD and Neuromuscular Dentistry. He recently completed Dr. Clayton Chan’s courses, at the Occlusion Connections Center of Gneuromusclar Dentistry and Orthopedic Occlusal Advancement in Las Vegas, NV. Dr. Chan’s “Optimized Bite” approach recognizes that proper jaw position as it relates to the cranium and the teeth is crucial to a healthy balance of musculature, jaw joints, and the accompanying structures that are crucial for optimal function, stability, protection and comfort. Dr. Yount’s systematic and methodical approach in determining the underlying cause of each patient’s complaint is critical to treating his patients. His dentistry is a blend of dental laboratory technology with additional education and experience which guides his knowledge of occlusion and the principles of the Optimized Bite™ to his custom made orthotics and TMD treatment. When the office is contacted by a patient inquiring about TMD, they are scheduled for a consultation appointment. Before this appointment, a TMD questionnaire is sent to the patient to be completed and returned to the office for the doctor to evaluate prior to the consultation appointment. At the consultation appointment, Dr. Yount discusses the questionnaire. This appointment may take two – three hours. During this assessment, Dr. Yount becomes acquainted with the prospective patient and learns more about his/her history. After a thorough exam and evaluation, based on the information gathered, Dr Yount makes a decision whether he can treat the TMD condition or not. This appointment also allows the patient to get to know the doctor and staff and decide if he/she would like to proceed with treatment. If a mutual agreement is reached, a records appointment is scheduled. The records appointment is very intense and usually takes five to seven hours depending on the severity of the case. Both the patient and the doctor are exhausted at the end of the records appointment and because of the intensity and length of this appointment; we recommend the patient have someone drive them home if they have traveled more than 20 miles. The records are crucial in determining the patient’s correct occlusial (bite) position. Dr. Yount is very thorough and discusses the results of his findings in detail with the patient. 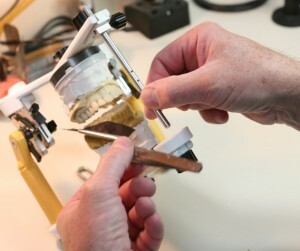 Once the bite is determined, Dr. Yount makes an orthotic for the patient based on the bite determined by the K-7 scan and Dr. Yount. The orthotic process takes up to 8 hours to complete and is fully constructed by Dr. Yount in his office. The next appointment for the patient is to deliver and adjust the orthotic. This appointment may take up to 8 hours. The appliance is designed to stabilize the bite and manage the patient’s TMD. As the patient’s muscles and bone positions change, adjustments to the appliance are needed. Many patients ask “How long will it take to straighten me out?” The length of treatment depends entirely on the patient. Some patients respond more quickly than others. Also, the length of treatment depends on the patient’s dedication to following the protocol established for them by Dr. Yount. 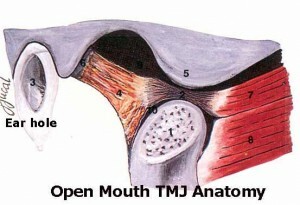 This joint is very important in treating most TMD patients. 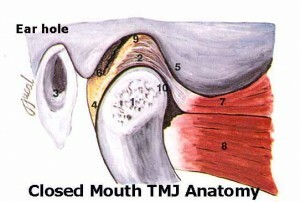 It is the joint that connect the jaw to the skull. These bones are held together and function in conjunction with the muscles, ligaments and other soft tissue of the face, neck, head and shoulders. This joint is unlike any joint in the body. It is unique in that it functions both vertically and laterally. When these functions are interrupted for any reason, the muscles go into spasm resulting in back, neck and shoulder pain, headaches and a tired feeling associated with trying to eat or speak. This pain can be constant or intermittent lasting for days, hours, months or years, if it goes untreated. Other symptoms presented when this joint is not functioning correctly are clicking, grating, popping, or crackling sounds in the jaw or temporomandibular joint. A person can experience tender pain in the temporal muscles along both or one side of the head; soreness in the muscles behind the head, neck and shoulders; tender or sore muscles of the chin and front neck area, mouth locked shut or open or limited opening of the mouth, clenching or grinding of teeth, posture problems, on numbness of fingertips and hands, insomnia and nervousness.